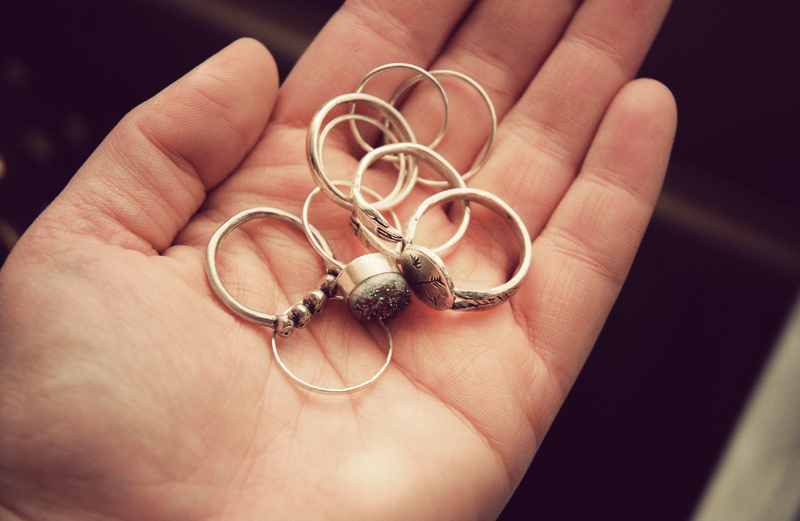 I often get asked where I get my rings from…My ring collection is my favourite thing, I have collected rings since I was little, I had a bit of a cull of my collection in my last year of uni, selling rings to pay for food, oh those were the day…. recently I have been trying to accumulate pieces that mean something to me, each Datter piece I own I buy when I reach a milestone in my life or when I want to treat myself after achieving something that means a lot to me, I am currently commission Kaye to create me a special ring. I wear eight rings everyday. A lot? I know i always feel naked with out them. I only ever buy silver rings, I never buy cocktail rings or non-silver as I like to wear my rings constantly, so I hate it when you get the green finger thing from a ring…frustration so I stick to silver. I always buy a piece that I would like to hand down to my family (my daughters haha i like to think of the future) I never spend too much as I don’t think a good piece needs to be pricey. The beautiful druzy quartz ( a few similar ones ) and my two above the Knuckle rings are from Dixi, a new firm favourite, I bought these as a little treat to myself, my Grandma bought me an above the knuckle ring when I was little and I lost it, these silver ones really remind me of the ones I had as a child. My super skinny fine rings are from I heart Ramsi you can find them on etsy. Oh and there is a little silver band in there that my dad bought me, when I was 12 from covent garden for a day out, so I would always remember our day together hasn’t left my fingers in 12 long years. To me each piece reminds me of a time in my life, a moment and how i felt. I have over 300 silver rings at one point i think it might of reached about 500 but these 8 are my favourites. Do you wear any rings? Do you have any favourites? Your rings are lovely. It's so nice that you have stories relating to some of them, and your handing them down to your children will give them stories to tell as well! Unfortunately I don't have a jewelry collection, but your post does inspire me to start one. They're so gorgeous!! I especially love the little arrow ones! oo these are lovely rings!! The only rings I wear are my wedding and engagement rings. I've nominated you for the 'Very Inspiring Blogger' award. I have fat finger!! (Sad face) I love rings and wish I could buy more. I love all your rings!! I've had my eye on a couple of Datter's rings too! Love your rings, I can't believe you have so many! i really love rings lately, and these are gorgeous. definitely want to start building a collection! I have tiny fingers so I'm always terrified of losing rings. I only ever wear my engagement ring. I always lose my rings! I go through phases of buying lots from Topshop etc and then within a few weeks they've gone missing in my apartment! I always love rings but I always felt weird buying them for myself, but I think Datter has convinced me otherwise. I'm sure the claddagh my boyfriend bought me wouldn't mind company. Rings are so awesome. 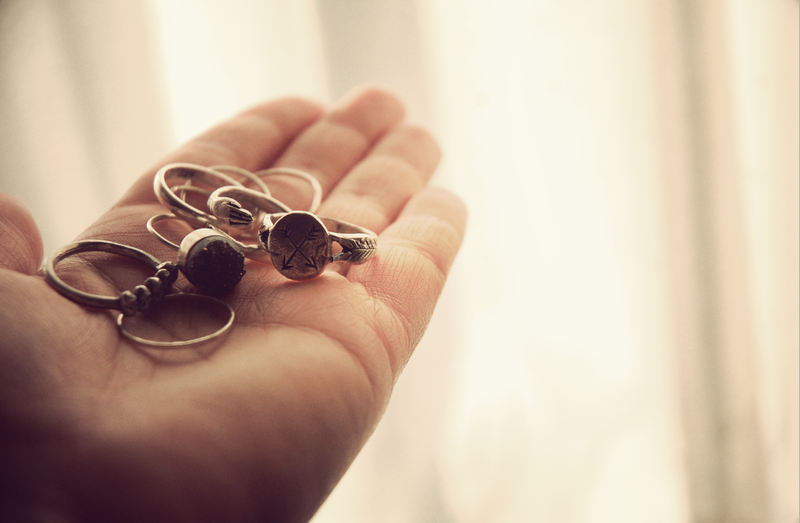 Beautiful rings – I think it's wonderful to have jewellery that means so much. My favourite ring (after my wedding rings… maybe…) is a gold Chewbacca ring my best friend got me. Just before I got married I had a horrible time after I got sent the wrong wedding dress from the etsy seller a week before my wedding – and that same seller refused a refund. As a hater of wedding dress shopping I really didn't want to go out and find anything…so instead we went opshopping and my friend bought me an awesome Chewbacca ring. Best present ever. All the rings looks so beautiful and they are perfect as engagement rings. I can't wait to get a ring like that. It was such a nice ring. Thank you so much and keep posting things like this.